I have the iBert front-mounting child seat. I've used it previously attached to my street bike as in the below image, but between the straight bars and the shifter triggers, I had to mount it so low that my knees knocked against it while riding, which is a non-starter. I recently acquired a long-tail cargo bike with cruiser-style handlebars, which I intended to use with the iBert seat. Unfortunately, the stem is fixed-height and does not have the 3/4" straight length between the frame and handlebars required for the T-bar mounting post (see the maker's website). However, the seat post is adjustable, so I thought I might be able to simply mount this seat in the rear instead. Most child seats are rear-mounted, the seat post seems as durable as the stem, and in this configuration the seat won't be moving side-to-side as it does when attached to the stem. Is this likely to damage the bicycle? Is there reason to think this would be unsafe for my passenger? I am also not sure if the legs of the seat will interfere with the rider in front; assuming it's safe enough for the passenger and the bike, I can test that out on my own. The bike is equipped with a sturdy double-leg kickstand, such that both tires are in contact with level ground when the kickstand is deployed and the bike is stable for loading/unloading. Wth the childs's legs sticking forward the way the website suggests, you've got no hope. 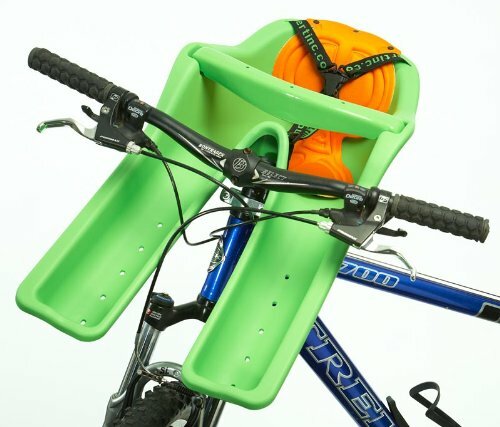 You could easily check this by fitting the seat and trying to ride without the child -- that way you don't even need to do the clamps up tight. You're also likely to find that the slumped-foward head rest sticks into your lower back and means that you're badly positioned on the saddle -- just what you don't want when you're controlling a bike with an extra load up high. Most people I see riding with front mount seats have to ride with their knees very wide to avoid the seat -- and this is a wider seat than I've seen on the road. It seems to me that there's only quite a limited set of bike/rider/conditions combinations for which front seats work: You need to be at the small end of your frame's adjustments, with wide bars, and riding on flat roads where you don't need to work hard to accelerate. Not the answer you're looking for? Browse other questions tagged safety child-seat or ask your own question. Are reflectors mandatory by the UK highway code?